Should We Blame a Florida Pastor for Deaths in Afghanistan? 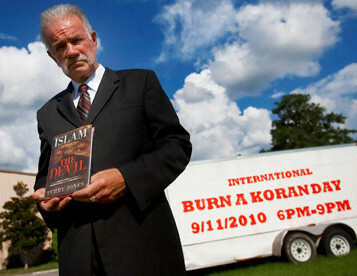 Pastor Terry Jones prepares for his mock trial of the Koran. Jones, however, did not cancel the ceremonial judgment of the Islamic scripture – he only delayed it by six months. 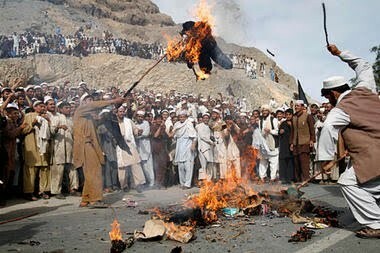 On March 20, in a six-hour ceremony called "International Judge the Koran Day," he convened a mock-judicial process in Florida that deemed the book "guilty of crimes against humanity," then set a copy on fire. The event was intentionally ignored in the United States, in the hopes of limiting its impact, but little stays secret in the Internet age. Within two days, news of the conflagration had reached Pakistan and Afghanistan, where the country's presidents roundly denounced Jones, bringing his action to wide notice. On April 1, infuriated Afghans lashed out, killing twelve in the northern city of Mazar-i-Sharif; the next day, suicide bombers dressed in women's clothing attacked a coalition base in Kabul and street mobs in Kandahar again killed twelve. Who is morally to blame for these deaths, Jones or the Islamists who seek to apply the laws of Islam in their entirety and as severely as possible? Not surprisingly, Jones called the killings a "criminal action" and asserted that "We must hold these countries and people accountable for what they have done as well as for any excuses they may use to promote their terrorist activities." Senate Majority Leader Harry Reid (Democrat of Nevada) said, he will "take a look" at introducing a resolution to condemn the Koran burning. Senate Majority Whip Richard J. Durbin (Democrat of Illinois) held that "this pastor with his publicity stunt with the Koran unfortunately endangers the lives of our troops and the citizens of this country and a lot of innocent people." Chairman of the House Intelligence Committee Mike Rogers (Republican of Michigan) requested every American to "be thoughtful and mindful of each citizen's responsibility to do their part to make sure our soldiers come home safely." In light of this blame-Jones consensus among the elite, the replies to a poll sponsored by a left-wing U.K. newspaper, the Guardian, come as something of a surprise. Asked whether "the Florida pastor who burnt the Qur'an [is] morally responsible for the deaths of UN staff in protests in Afghanistan," only 45 percent blame Jones and 55 percent blame the Islamists. Indeed, some non-Islamist American Muslim leaders concurred with this sentiment. M. Zuhdi Jasser of the American Islamic Forum for Democracy in Arizona blamed the killings on extremist leaders who exploited the Koran burning as an excuse for violence. The imam of an Ahmadiyya mosque in California, Shamshad Nasir, said his community "rejects any killing in the name of religion anywhere, even if it is done in the name of the most sacred scriptures." As I wrote last September, when Jones threatened to burn a Koran, the "violence stems from Islamic law, the Sharia, which insists that Islam, and the Koran in particular, enjoy a privileged status." That insistence, which has been asserted in the West since 1989, when Ayatollah Khomeini put an edict on Salman Rushdie for his novel, The Satanic Verses, must not be indulged. Islam is one religion among others, with no claim to superior status. Indeed closing down the claim to Islamic supremacism may be the single greatest challenge to modernizing Islam. However distasteful, Jones' act is both legal and non-violent. He is not responsible for the 43 deaths; the repugnant, barbaric ideology of Islamism is to blame. When will U.S. politicians realize this basic fact and stand up robustly for the civil liberties of American citizens? Critiquing Islam, tastefully or distastefully done, is a Constitutional right. Indeed, done intelligently it is a civilizational imperative. Apr. 8, 2011 update: For reasons of space, I did not mention two double standards above: (1) the Koran is sacrosanct but the Bible is suitable for toilet use, which I previously discussed at "Istinja' with the Torah and New Testament"; and (2) Muslim property and life is inviolate but it's open season on the Christian equivalents, something Raymond Ibrahim exposes at "Destroying One Koran vs. Destroying Many Christians: Which is Worse?". Related Topics: Freethinking & Muslim apostasy | Daniel Pipes receive the latest by email: subscribe to the free mef mailing list This text may be reposted or forwarded so long as it is presented as an integral whole with complete and accurate information provided about its author, date, place of publication, and original URL.